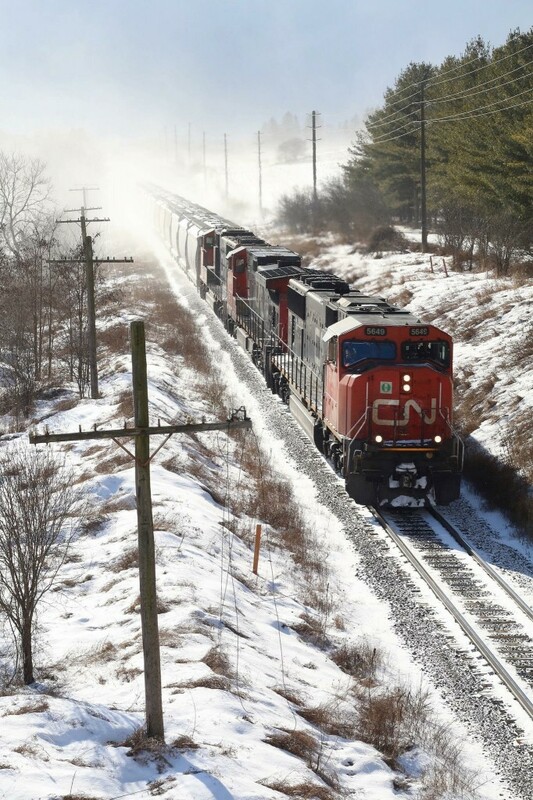 Railpictures.ca - Marcus W Stevens Photo: I’m not a big fan of shooting into the sun but I couldn’t resist the rare chance to photograph CN 431 in daylight today as it races away from fast approaching lake affect snow squalls just east of Guelph. Today’s consist is a pair of SD75’s bracketing a Dash 9 as the train is about to duck under Jones Baseline Road. | Railpictures.ca – Canadian Railway Photography – photographie ferroviaire Canadienne. Caption: I’m not a big fan of shooting into the sun but I couldn’t resist the rare chance to photograph CN 431 in daylight today as it races away from fast approaching lake affect snow squalls just east of Guelph. Today’s consist is a pair of SD75’s bracketing a Dash 9 as the train is about to duck under Jones Baseline Road. I heard it was mechanical issues but not sure what. Apparently this was 542’s crew that took the train to Toronto I was told. I guess that explains why I never saw 542 this day. I see what you mean. Are you or anyone else on here aware as to why this particular run was in daylight? Earliest 431 I personally ever seen under GEXR was in August 2018 when they ran westbound through Mount Pleasent at about approx 09:30 and while I’m sure exactly why they ran so early, my guess would be that either a locomotive died at Mac Yard the day before or there was just a major delay of the train in general. I got an alright shot of it too (mind it looking in the sun) and hopefully it’ll be in here some day. He was eastbound but apparently is 431 in both directions unless the train starts at Kitchener I guess if it dies there. Cool shot, I hope to someday stumble upon the opportunity to catch 431 in daylight too. Which direction exactly was this in?